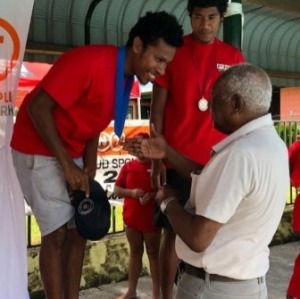 AN exciting weekend of competition in Lae was witnessed by all who attended the 2018 TNT National Short Course Swimming Championships over the weekend of 21-23 September. After a 6 year spell of not having the event in Lae PNGSI thanked the Lae Amateur Swimming Club and its executives for hosting the Championship in 2018. This prestigious annual event on the PNGSI calendar brought together our talented and enthusiastic swimmers and volunteers from around the country. During the competition the 60 plus athletes challenged themselves in their individual races knowing at the completion that they had done their best in competition. The running of the TNT National Championships in an efficient manner was made possible by the cooperation of the 36 technical officials under the direction of FINA Referee Sue Babao, allowing the TNT Championships to be run in a professional manner under FINA competition rules. Medals at the completion of each session were presented by PNGSI Patron Bart Philemon and TNT Lae Branch Manager Valmay Barry. “No competition can take place without a major sponsor in place. TNT has once again provided the needed funding and support in kind to the officials and athletes to enable the competition to be a success.” “We are very proud and privileged to have them on board again in 2018.” “I express our sincere appreciation and thanks for their continued support they give to swimming and these championships,” said Papua New Guinea Swimming Inc President Liz Wells. THE 2018 TNT National Short Course Championships was an important occasion for our athletes to swim qualifying times to gain a place in the BSP Aquatic Excellence Squads: Junior, Intermediate Silver and Gold, Kundu Target Squads Bronze, Silver, Gold, Platinum and Diamond. Twenty-nine swimmers swam times to register on a National Aquatic Excellence Squad.